I’ve been replaying Up Your Arsenal, the third entry in the Ratchet and Clank franchise. It’s definitely better than the original, but doesn’t quite live up to Going Commando, at least in my humble opinion. But it does have one interesting feature that its predecessor did not: Trophies. Not PSN Trophies, mind you. This game came out in 2004, before PSN Trophies or XBox Live Achievements were even a thing. These trophies are completely self-contained within the game’s architecture. Roughly half of them are found as item pickups stashed away in certain levels, while the other half are task-oriented, requiring actions like fully upgrading all weapons or completing all arena challenges. I’m mentioning this because I feel like it’s relevant to my post last week on video game secrets. It provides a good example of what I like about secrets, yet dislike about XBox Live Achievements or PSN Trophies. The difference is subtle, but significant. There isn’t much functional difference between how you obtain Up Your Arsenal Trophies and how you obtain PSN Trophies: completing tasks or finding specific items. The difference is that PSN Trophies exist outside of the game’s architecture, while the Up Your Arsenal trophies exist within the game — and are even viewable on the Starship Phoenix. You have a trophy room near your quarters where you can admire your shiny gold collection and zoom in on each for a closer look. Even this small feature is enough to put these trophies head and shoulders above PSN ones for me. It feels more tangible because it’s more than just a text pop-up and a point value. It’s like a Star in Super Mario 64, or a colored gem in Crash Bandicoot. I can admire it spinning and glowing in all its computer-rendered glory, and that brings me an unreasonable amount of satisfaction. Actually, though, there’s way more too it than just gazing lovingly at your hard-earned collection. Obtaining every trophy also unlocks the Insomniac Museum, a series mainstay and one of the finest secrets in gaming. The Museum, which appears in Going Commando, Up Your Arsenal, and A Crack in Time, features a bevy of cut content, complete with developer commentary, as well as extra mini-games and some weird, quirky minigames. It’s the perfect secret: practically pointless but awesomely cool at the same time. The Museum is never the same from game to game, but the requirement for entry, 100% completion, is generally the same. When I see Platinum Trophies on PSN, I always ask myself, “Why can’t there be an in-game reward for that?” A super secret weapon, or an extra area, or a message from the developer, or even an extra costume, for Maker’s sake. Achievements don’t inherently detract from a game, but without adding to the experience, they don’t add anything either. I would love to see developers base achievements around tasks already included in-game that unlock in-game rewards — preferably tasks that aren’t one-time chances like so many achievements and trophies these days. 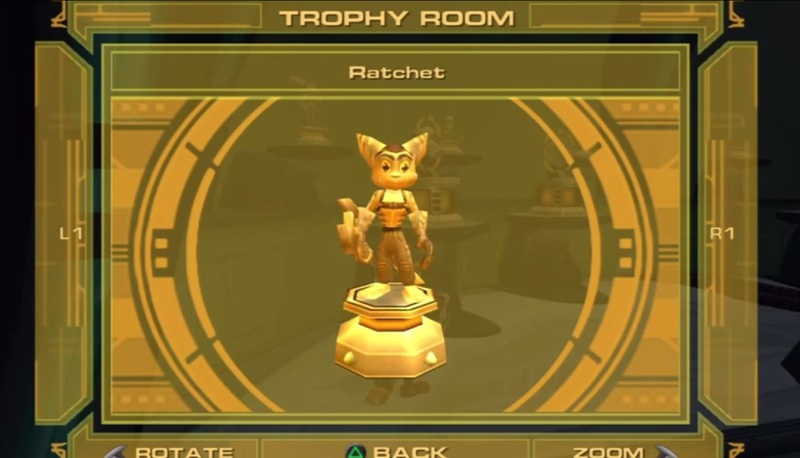 The real hilarious part of this whole story is that Up Your Arsenal was re-released for PS3 as part of the Ratchet and Clank Collection, which includes — you guessed it — PSN Trophies. Most of the trophy requirements overlap with those for Trophies and Skill Points in the original game. So by obtaining all the PSN Trophies, you obtain in-game Skill Points and Trophies, which unlock cheats and grant access to the Insomniac Museum. Or vice-versa, however you want to look at it. And honestly? I have no problem with that. It’s a shame that it takes a game that had PSN Trophies added in after the fact to demonstrate the point, but it’s an important one all the same: in-game rewards, even simple cosmetic ones, always trump fake points that exist outside the game’s architecture.